Without directly acknowledging that cancelling the tender for building 126 fighters in India, and instead buying 36 fully-built Rafale fighters, was a missed opportunity, Defence Minister Nirmala Sitharaman has urged the Indian Air Force (IAF) to lead the way in indigenous manufacture. 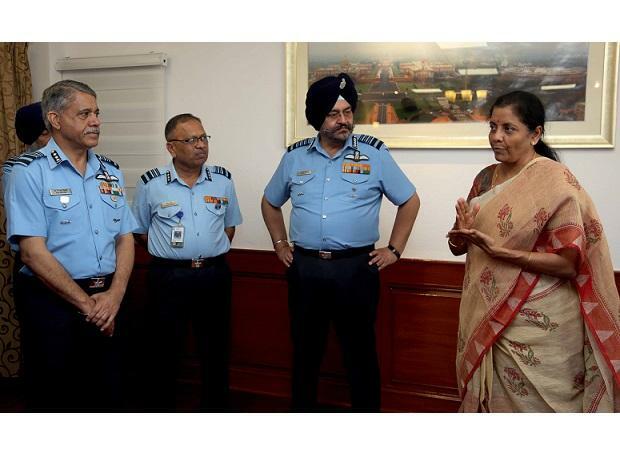 Addressing a meeting of top IAF commanders in Delhi on Thursday, Sitharaman said the IAF would “play a vital role in enhancing the defence manufacturing capabilities of the nation through its acquisitions in the form of strategic partnership (SP) model”. The SP model of procurement, which was promulgated in outline in May 2017, envisages Indian companies manufacturing four categories of weaponry — fighters, helicopters, submarines, and armoured vehicles — from design blueprints provided by a selected foreign vendor. However, there is little movement on the IAF’s only SP model procurement: to buy-and-build 114 multi-role fighter aircraft in India. Last April, the IAF issued a request for information (RFI), and seven fighter manufacturers expressed interest. A year later, with the Ministry of Defence (MoD) still fine-tuning the SP model, vendors are still awaiting an IAF tender. For shortlisting and selecting SPs, the MoD must promulgate “implementation guidelines” for each of the four equipment categories. But while the broad policy framework has been formalised and retrospectively incorporated into the Defence Procurement Procedure of 2016, implementation guidelines have been drawn up only for naval helicopters. Without implementation guidelines for choosing an SP for building aircraft, the MoD cannot issue a formal tender — also termed request for proposals — for the 114-fighter procurement. Meanwhile, seven international fighter manufacturers have responded to the RFI. Two single-engine fighters have been offered: Lockheed Martin’s F-16 Block 70 (which it has renamed F-21) and Saab’s Gripen E.
In addition, five vendors have offered twin-engine fighters: Dassault’s Rafale; Eurofighter’s Typhoon; Boeing’s F/A-18E/F Super Hornet, and two Russian fighters: Sukhoi-35 and MiG-35. Like the 126-fighter tender issued in 2007 and eventually abandoned in 2015, this 114-fighter procurement expects to galvanise the domestic aerospace industry. Proceeding in parallel, with the same aim, is the so-called Avro replacement project. This envisages a private sector Indian manufacturer — Tata Advanced Systems has been chosen — partnering Airbus to build the C295 medium transport aircraft in India to replace the obsolescent HS-748 Avro. The tender permits Airbus deliver up to 16 aircraft in flyaway condition, and build at least 40 in India. The MoD and Airbus are currently negotiating prices. At the Aero India 2019 expo in February, both Sitharaman and the air chief, Air Chief Marshal B S Dhanoa, mentioned the C295 as a ‘transformative’ project. While both the 114-fighter and C295 projects involve manufacturing in India to foreign blueprints, Sitharaman also “asked the IAF to look at the future with the latest technologies available across the world and those that can be developed within India, in order to meet its needs,” according to the MoD. This would require shifting emphasis from licensed manufacture to indigenous aircraft development, such as the Defence Research and Development Organisation’s Tejas fighter and the futuristic advanced medium combat aircraft. Technology development and absorption are also achievable through co-design and development such as the Indo-Russian fifth-generation fighter aircraft project and the future generation tempest project in the UK. However, the MoD has backed away from the former and not yet responded to the latter. According to the MoD, Sitharaman also “praised the IAF for its flawless execution of the Balakot strikes and subsequent thwarting of the Pakistani response”.